We are offering a unique opportunity for the perfect applicant(s) to participate in the good sanctuary life here and to turn their values of compassion into hands-on experience. This is a special opportunity to make a meaningful contribution to Animal Liberation and to advocate for the sanctuary residents and their peers, while also contributing to a small community of like-minded people dedicating their lives to animal persons. This summer, Piebird will celebrate twelve years of being a happy home for animal-friends, a vegan agri-tourism destination, & heirloom seed co in Nipissing, Ontario. 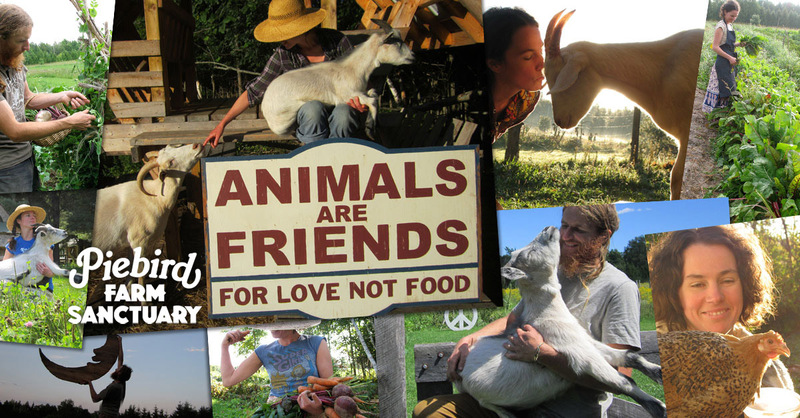 If you are keen for this Earth-based lifestyle and dedicated to animal advocacy & vegan outreach, then come add your life to this place of love. Piebird is a vegan farm, farm sanctuary, B&B / guesthouse, cottage rental, seed company, sustainable living workshop series, vegan cookie business, vegan restaurant by reservation, etc... - this list may make it sound like it's pretty bustling around here, but it is actually just the two of us (and maybe you) plus the guests, so things are indeed very quiet. Interns are asked to fulfill a fairly full but flexible work schedule and make a one month to several-month commitment. There may be opportunity for the position to extend into long-term cooperative living for persons who demonstrate deep commitment to the spirit, goals, lifestyle and peace of Piebird. Interns live on-site (various housing options) and very much become part of life here at Piebird. Note: a farm sanctuary internship is a volunteer experience, applicants should be self-reliant and have either savings or an income separate from Piebird. For longer stays, there are income opportunities for the right candidate. The sanctuary itself is supported by Piebird's overnight bookings and sanctuary-capacity is increased by generous donations. Out of respect for the sanctuary-residents and the work that Piebird does, all Piebird-humans are of course required to eat vegan (no meat, dairy products, eggs, honey, or other animal byproducts). Interns are responsible for buying and preparing most of their own food, with some communal eating. During the internship, you will have the hands-on opportunity to gain considerable knowledge of compassionate animal-friend care. You will learn-from and fall-in-love-with the sanctuary residents. Interning at Piebird also offers experience beneficial for future alternative-lifestyle choices. 2018 Residency opportunities are available beginning Spring. Other land-share opportunities may be available in the future as we transition into a co-op opperated farm sanctuary. Due to the sanctuary work-load, we might be slow at responding. Strong, healthy and flexible. This life is physically demanding, you may need to lift 30lbs or more. Handy, resourceful, or domestic. Or some other sanctuary-valued skill (make a note of this in your application). Outdoorsy, not afraid of bugs. An honest, open communicator. Previous experience in compassionate communication a bonus. Able to provide your own transportation. Equipped with fabulously proper conversation skills and manners. Piebird is a vegan agritourism destination (that's how we support the sanctuary) so you will be running into and chatting with guests who will have questions about the animals, the garden, your homemade skirt, your beard, goat's beards, turkey dancing, ethical veganism, anything you can imagine... Communicating the values of Piebird is important. Internship opportunity can grow into a long term living situation if you have the right work-ethic, humour, ethics, & endurance. We are currently exploring transforming the sanctuary into a co-op. Please note we do not have room for dogs, due to the free-roaming nature of other feathered/furry residents. Send us an application in whatever format gives you a thrill. Send a short letter about why you want to intern here and why you'd fit in perfectly. Be sure to include what dates and duration would be ideal. Include whatever creative elements you need to fully communicate who you are. Send us a letter or email outlining your skills, your goals, ambitions, experience, your activism history or creative thwarting, things you've built or grown, funky places you've lived, ...or whatever else we need know about you & how you'll fit into Piebird. Tell us what Piebird Farm Sanctuary means to you and We will need two references that aren't family -- previous employers or volunteer co-ordinators etc., send along their phone numbers so we can give them call. Let us know how you you will prove to us that the vast energy it will take us to train you and the trust we need to share our precious family with you will benefit the sanctuary. If you are a couple applying, please apply as individuals, together! Piebird was started in 2005 by Sherry and Yan. We are located in Nipissing, on a quiet gravel road 3 hours north of Toronto, Ontario. Piebird is a celebrated destination for Earth-conscious folks and vegan travellers. The animal-friends who reside here in sanctuary guide their own lives, many choose to be ambassadors for all those who have not yet made it to sanctuary. We grow vegetables, seeds, smiles and rainbows. We do workshops on gardening, yurt building, herbal medicine, vegan baking, compassionate living and the list goes on! In August, we host our annual Piebird Picnic. 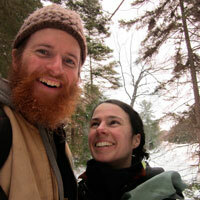 Interns will also have access to our secret 15 acre secret retreat up the secret river via canoe. MEET SHERRY: The animal-friends here call Sherry, "Lady Sweet Pockets." Sherry kisses every single animal-friend every single time she sees them and makes an obscene amount of vegan cookies. Her hobbies include kissing animal-friends and making obscene amounts of vegan cookies. MEET YAN: Much like the turkey-friends here, Yan refuses to leave the garden, ever. His hobbies include building giant peace signs and starting campaigns to take down evil corporations. You can meet some of the animal-friends online here.